All comments are welcome. Feel free to submit them at JeanCloutierOtt@ottawa.ca. Wednesday, May 24, 6 to 8:30 p.m.
You are invited to attend an open house for the Elmvale Acres Shopping Centre Secondary Plan. By attending, you will have the opportunity to review the final draft of the Secondary Plan schedules and policies before they are presented to Planning Committee in June and City Council in July. 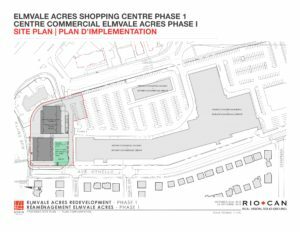 The Secondary Plan describes how the Elmvale Acres Shopping Centre property at 1910 St. Laurent Boulevard will be redeveloped over the next 20 years. The proposed Zoning By-law Amendment will also be presented at this meeting. Accessibility is an important consideration for the City of Ottawa. If you require special accommodation or French language services, please contact Melissa Jort-Conway no later than Wednesday, May 17. Please be advised that the Open House scheduled for Wednesday, February 15, 2017 has been postponed. Many comments have been received on the Draft Secondary Plan and Concept Plan and additional time is required to review and respond accordingly. We expect that the Open House will be rescheduled for sometime this Spring in order to present finalized draft plans to the community. Notice of the Open House will be sent out as soon as the new date is confirmed. Please feel free to share this update with your neighbours. This page is dedicated to keeping you informed on changes occurring in the Elmvale Acres community. 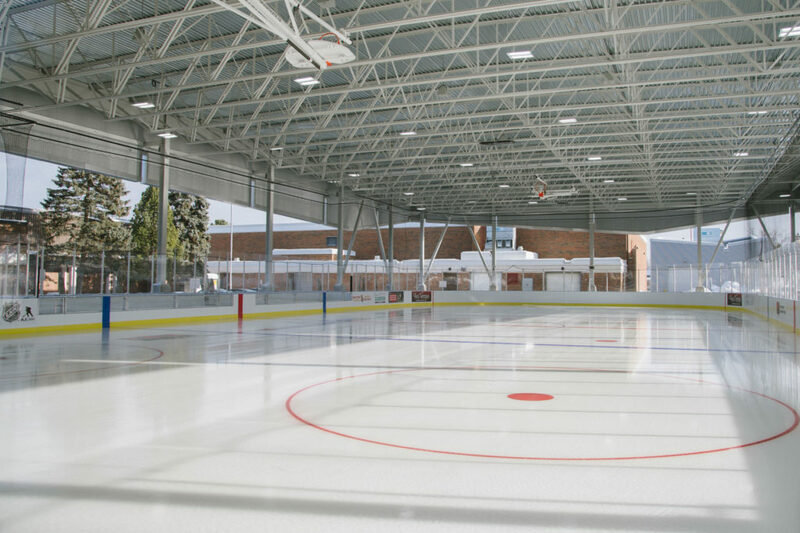 Please be advised that the City has now received the Draft Master Plan and Draft Secondary Plan for the redevelopment of the Elmvale Acres Shopping Centre (1910 St. Laurent Boulevard). For those unable to view the documents on-line, a hard copy set of the plans and supporting documentation will be made available at the Elmvale Branch of the Ottawa Public Library (1910 St. Laurent Boulevard) by the end of this week (Friday, January 20). Notice has been sent by mail to those who commented in writing. We welcome your comments on the Draft Plans. 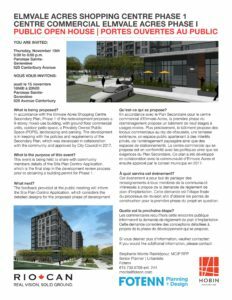 Please send them to my attention at JeanCloutierOtt@ottawa.ca or to Sean Moore, Planner III using the contact information below. An Open House will be held in mid-February. The Open House will be advertised and a notice will be sent out.